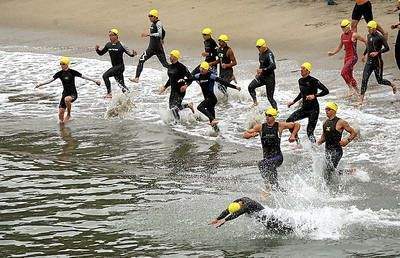 The Sandman Triathlon is one of the oldest races in Santa Cruz County and turns 30 years old on Sunday. And despite the recent great white shark sightings at Seacliff State Beach in Aptos, just as the ringmaster of a circus would say: the show must go on. The shark sightings haven’t been much of a dilemma for first-year race director Jennifer Murray, but she said the thought of it might still linger in the back of people’s minds. Ryan Nothhaft, 33, of San Jose will run in his 10th straight triathlon on Sunday and said the course alteration might affect people new to swimming in the ocean. But from a race perspective, it won’t change the dynamic of the event up front. Race officials will also be honoring the Santa Cruz County Shark Action Plan, a countywide law enforcement agreement for managing shark sightings. Race officials will cancel the swim if lifeguards observe sharks in the area of the swim course within 24 hours of the race. Santa Cruz State Parks Lifeguard Supervisor Eddie Rhee Pizano has also been a big help for Murray, who said he’s been scouting the beaches every day for ocean safety and conditions. Murray contacted the USA Triathlon for some tips on what to do if a shark sighting occurs during the race but said the organization told her they’ve never encountered a situation like it before. “They were pretty much like ‘Let us know how this goes,’” Murray said. The good thing for Murray is she hasn’t had to deal with ocean attacks yet. Instead, she can focus on her second stint as a full-time race director and the 30-year anniversary of an event that started as a simple fundraiser for kids. “It’s been wonderful, the State Lifeguard Association is really great to work with,” Murray said. Murray said the Sandman Triathlon helps the junior guards by providing financial assistance to the program. The event was started by the Santa Cruz State Parks Lifeguard Association to raise funds for the local State Parks Junior Lifeguard program, including providing scholarships for kids from low-income families that otherwise could not afford the cost of the four-week program. Santa Cruz State Lifeguard Association president Cody Gilbert has some close ties to the event as his uncle, Pat, helped create the Sandman Triathlon along with the Capitola Junior Guard Program. “We’re just trying to get as many people as we can out to the race and continue on with his mission,” Gilbert said. As for Nothhaft, he said Seacliff Beach has been calling his name ever since he finished his first race in 2006. Murray, who lives in same neighborhood as where the triathlon is put on, said it’s great to have the event in a beautiful area such as the Central Coast. 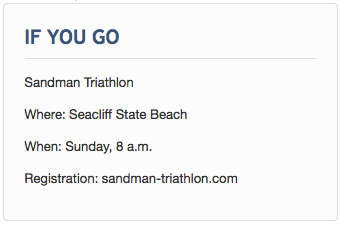 She added that it’s also the only triathlon race that she’s seen that makes runners take part in an all-sand course.